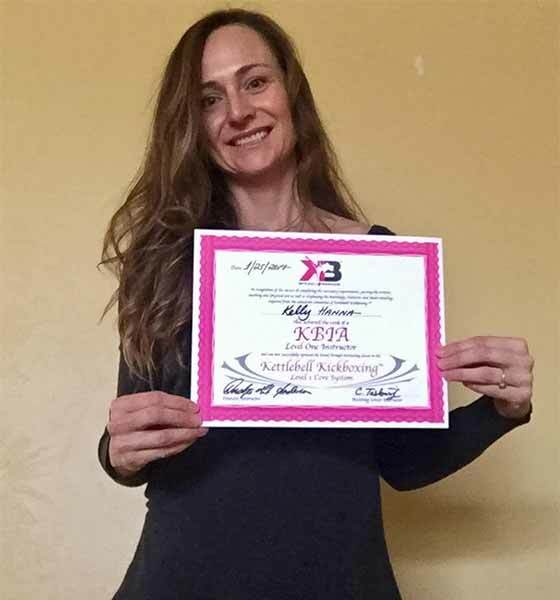 Kelly Hanna is a Certified Kettlebell Kickboxing Instructor KBIA™ and an ACE Personal Trainer. After many years of practicing yoga she began searching for workouts that would complement her yoga practice and build strength, endurance and mobility. When she found Kettlebell Kickboxing she knew she had stumbled upon something exceptional. After a few months of a steady kettlebell practice, she began to pursue becoming an instructor. She began leading Kettlebell Kickboxing inspired classes in May of 2016 and completed her instructor certification in March of 2017.
because they are efficient and highly effective. Cardiovascular conditioning, endurance training, strength and mobility can all be achieved without spending hours in the gym. Kelly says the most exciting part of a kettlebell practice is seeing how the activities in your day to day life improve. After just a short time practicing, you will find yourself doing necessary activities like house and yard work, as well as recreational ones like, running, skiing or biking, with greater ease and increased strength and endurance. working as a licensed Massage Therapist, and several years working in hospitals and clinical settings as a Registered Respiratory Therapist. Health and wellness have always been her passion. Instructing Kettlebells has allowed her to help others facilitate their own wellness through movement. or practicing yoga, Kelly enjoys skiing, cooking and hanging out with her husband, kids, and friends. Kelly resides in Louisville, Colorado.